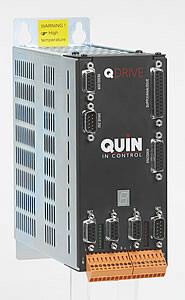 The mini QDrives are a cost effective option for low power applications. Many drives currently integrate some form of in-built intelligence to control motions. Most are restricted in use by the limitations of their software tools and functions. But, with its integrated Programmable Transmission System (PTS) software, the mini QDrive overcomes this problem. Single phase supply between 100VAC and 240VAC, 4A nominal. Three phase supply 240VAC, 6A nominal or 9A nominal. No cables needed between control cabinet and motor drive amplifiers. Compact design saves even more space than the standard QDrive. Reduced, installation time and cost over traditional systems. Local digital I/O and supports external encoders including CANopen absolute encoder. Please call us to find out more about our support and upgrade services.